Love to cook? Why not a Black Forest Cake for dessert? Perfect! Bake a delicious, mouth-watering, creamy and chocolaty cake loved by most of us at home. Easy as a pie, effortless and more tasteful than the Bakery, alert your taste buds to enjoy this homemade dish from Germany. First presented in 1915, the dessert has been named after the special liquor in South-Western Germany known as Schwarzwalder Kirsch and is made from cherries, cookies and cream. Enjoy the German flavour at your dining table amidst the desserts today. Follow the simple recipe and plan a delightful surprise for your family to make every occasion a celebration. Can find these in your pantry? No worries, one can easily search these ingredients at the nearby stores. Too tired to shop? Not an issue. Order online from premium stores by using these grofers offers and get flat Rs 500 cashback additionally on your order along with getting them delivered at your doorsteps. This recipe delivers you a classic German Black Forest cake filled with whipping cream and cherry toppings. First, prepare the cake turns. Use two 8 inch rounded cake pans. Grease them with melted paper and line the base with baking parchment or butter paper. Combine the dry ingredients – flour, cocoa powder, baking powder, baking soda, and powdered sugar in a large bowl. Now, add wet ingredients – canned milk, melted butter, vanilla extract and 1 cup of water to the mixed dry ones. Blend these ingredients now using hand blender for 2-3 minutes to form a batter. Don’t over blend otherwise it will lead to less softer cake. You can add two table spoons of hot water for a softer cake. Then mix it for just a few seconds. Put the batter equally in the two pans. If you have a single pan, you can slice the cake later. Need not to worry. Pre heat the oven to about 150 degree centigrade. Put these pans into the oven and bake for about 25-30 minutes or until the wooden toothpick, inserted in centre, comes out clean. Then cool the layers in pans for about 10-12 minutes. Finally, loosen the edges, and remove to racks to cool completely. Let’s prepare the cherry syrup now. Put two cups of pitted cherries in the saucepan. Add 4 tea spoons of sugar and 175 ml (3/4th of a cup) to it. Let’s cook this till the sugar melts completely. You need to stir it continuously and keep the flame low. If the cherries are soft cook for 5- 10 minutes else you need to cook a little longer. Next step is to whip the cream until soft peaks appear. Use some of the cream to fill the centre and rest to ice the cake. Clean up the extra creams to make it look clean. Now assemble the cakes and add cherry syrup on top of the layers. Fill the centre with cream and a few cherries. Put cream at the top layer also. Make some creamy flowers at the edges of top layers to look attractive. Then add cherries on top of these. 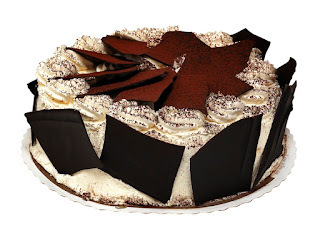 Finally, add chocolate curls to your cake to look appealing and decorative. To add chocolate curls slice up the chocolate bar. Once sliced up add these chocolate shavings on all sides of the cake and in between of the icings at top layer. Watch how to prepare this delicacy at your home in this video. Homemade dishes are everyone’s favourite. 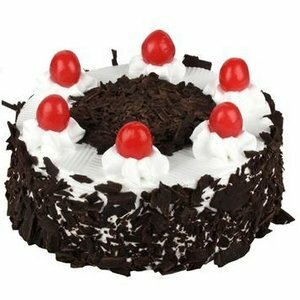 Prepare this frosty and tasty looking cake and spread happiness amongst your admirers. Don’t feel like making? Order this cake online from stores like foodpanda, swiggy etc a to buy it cheaply. Enjoy the dish and embrace the taste like never before.